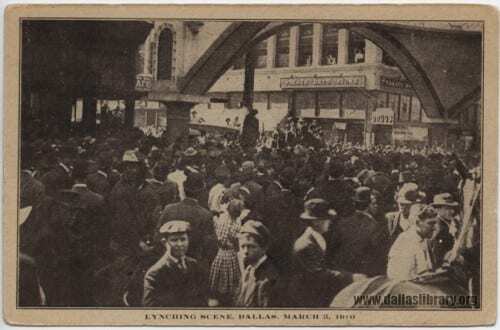 Print souvenir postcard of Allen Brooks Lynching, March 3, 1910. Cook Dallas/Texas Image Collection, DeGolyer Library, SMU. A high-quality version of this file may be obtained for a fee by contacting degolyer@smu.edu. “Print Souvenir Postcard of Elks Arch, Brooks Lynching 1910.” Accession number 23. From the collections of the Texas/Dallas History and Archives Division, Dallas Public Library.